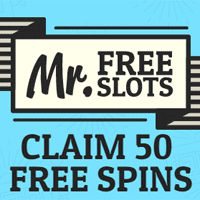 Head over to Mr. Free Slots where they are giving away 50 free spins just for signing up. Just follow our link and fill in the small form to register and you will instantly get free spins which you can instantly use and try out your luck and win some money. Click on “GET IT HERE” button and then follow instructions given above to get your free 50 spins.